If you’ve tried to buy a pair of athletic shoes recently, you probably noticed the wide range of high-tech, state-of-the-art athletic gear. Consumers are faced with so many options that the task of choosing a pair of shoes has become increasingly complicated and confusing, not to mention expensive. By attaining a good working knowledge of athletic footwear, you’ll help yourself find the perfect pair of affordable shoes. When shopping for athletic shoes, the first step is deciding what type you need. If you engage in a specific activity two or three times each week, such as running, walking, tennis, basketball or aerobics, you’ll want a shoe designed specifically for that sport. Multipurpose shoes such as cross trainers may be a good alternative for those who participate in several sports or activities, such as cardiovascular and weight training, in a single workout. Ideally, you should look for a specialty athletic shoe store with a good reputation in your community. Their sales staffs are more likely to be knowledgeable about selecting appropriate shoes. When purchasing shoes for a specific sport or fitness activity, consider your foot type. People with high-arched feet tend to require greater shock absorption than those with a normal-arched foot. People with high-arched feet also suffer from lateral instability and are more prone to ankle sprains. Conversely, people with low-arched (“flat”) feet require shoes with less cushioning, but greater support in the mid-foot region and better heel control. Grab the shoe at the ball and heel. Bend the shoe from front to back. The shoe should bend right near the ball of the foot, because that’s your foot’s natural hinge point, but the shoe must not be too flexible. At the heel of the shoe, find the “heel counter,” a stiff cup sewn into the back of the shoe to provide heel support. Squeeze this cup into the shoe. It should be very stiff and not easily collapse inward. Hold the shoe at each end and twist it. A shoe that offers good lateral support to the foot should only twist a little bit. Place the thumb of one hand inside the heel of the shoe and the other hand under the sole of the shoe near the heel. Compress your hands together to feel the amount of cushioning offered by the shoe. The more compression you feel, the more shock absorption the shoe offers. General recommendations include get fitted for footwear toward the end of the day. It’s not unusual for an individual’s foot to increase by half a shoe size during the course of a single day. However, if you plan to exercise consistently at a specific time, consider getting fitted at that exact time. Allow a space up to the width of your index finger between the end of your longest toe and the end of the shoe. This space will accommodate foot size increases, a variety of socks and foot movement within the shoe without hurting your toes. The ball of the foot should match the widest part of the shoe and you should have plenty of room for your toes to wiggle without experiencing slippage in the heel. Shoes shouldn’t rub or pinch any area of your foot or ankle. Rotate your ankles when trying on shoes, and pay attention to the sides of your feet and the top of your toes, common areas for blisters. 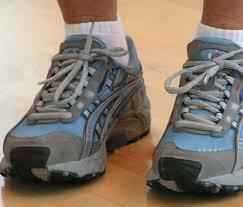 Wear the same weight of socks that you intend to use during activity. Look for socks that are made with synthetic fibers such as acrylic, polyester or Coolmax® for better blister prevention.